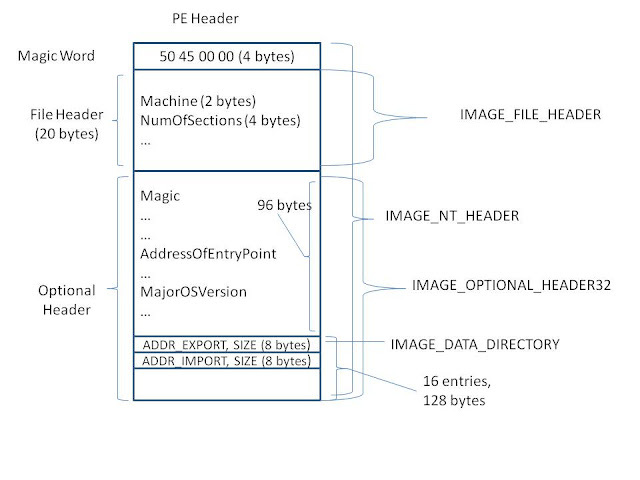 Understand the portable executable (PE) header of binary executables. Practice disassemble and reverse engineering techniques. In this tutorial, we will analyze the first harmful operation performed by Max++. It changes the structure of the export table of ntdll.dll. Recall the analysis of Max++ in Tutorial 7, the malware reads the information in TIB and PEB, and examines the loaded modules one by one, until it encounters "ntdll.dll" (this is accomplished using a checksum function inside a two layer nested loop). In this tutorial, we will reverse engineer the code starting at 0x40105C. Any binary executable file (no matter on Unix or Windows) has to include a header to describe its structure: e.g., the base address of its code section, data section, and the list of functions that can be exported from the executable, etc. When the file is executed by the operating system, the OS simply reads this header information first, and then loads the binary data from the file to populate the contents of the code/data segments of the address space for the corresponding process. When the file is dynamically linked (i.e., the system calls it relies on are not statically linked in the executable), the OS has to rely on its import table to determine where to find the entry addresses of these system functions. Most binary executable files on Windows follows the following structure: DOS Header (64 bytes), PE Header, sections (code and data). For a complete survey and introduction of the executable file format, we recommend Goppit's "Portable Executable File Format - A Reverse Engineering View" . DOS Header starts with magic number 4D 5A 50 00, and the last 4 bytes is the location of PE header in the binary executable file. Other fields are not that interesting. The PE header contains significantly more information and more interesting. In Figure 1, please find the structure of PE Header. We only list the information that are interesting to us in this tutorial. For a complete walk-through, please refer to Goppit's work . At run time of a binary executable, Windows loader actually loads the PE header into a process's address space. There are some well defined data structures defined in winnt.h for each of the major part of the PE header. As shown in Figure 1, PE header consists of three parts: (1) a 4-byte magic code, (2) a 20-byte file header and its data type is IMAGE_FILE_HEADER, and (3) a 224-byte optional header (type: IMAGE_OPTIONAL_HEADER32). The optional header itself has two parts: the first 96 bytes contain information such as major operating systems, entry point, etc. The second part is a data directory of 128 bytes. It consists of 16 entries, and each entry has 8 bytes (address, size). We are interested in the first two entries: one has the pointer to the beginning of the export table, and the other points to the import table. Modern binary debuggers have provided sufficient support for examining PE headers. We discuss the use of WinDbg and Immunity Debugger. (1) WinDbg. Assume that we know that the PE structure of ntdll.dll is located at memory address 0x7C9000E0. We can display the second part: file header using the following. Then we can calculate the starting address of the optional header: 0x7C9000E4 + 0x14 (20 bytes) = 0x7C9000F8. The attributes of optional header is displayed as below. For example, the major linker version is 7 and the the address of entry point is 0x12c28 (relative of the base address 0x7c900000). As shown by Goppit , OllyDbg can display PE structure nicely. Since the Immunity Debugger is based on OllyDbg, we can achieve the same effect. In IMM View -> Memory, we can easily locate the starting address of each module (e.g., see Figure 2). Then in the memory dump window, jump to the starting address of the PE of ntdll.dll. Then right click in the dump pane, and select special -> PE, we can have all information nicely presented by IMM. Recall that the first entry of IMAGE_DATA_DIRECTORY of the optional header field contains information about the export table. By Figure 1, you can soon infer that the 4 bytes located at PE + 0x78 (i.e., offset 120 bytes) is the relative address (relative to DLL base address) of the export table, and the next byte (at offset 0x7C) is the size of the export table. The data type for the export table is IMAGE_EXPORT_DIRECTORY. Unfortunately, the WinDbg symbol set does not include the definition of this data structure, but you can easily find it in winnt.h through a google search (e.g., from ). The following is the definition of IMAGE_EXPORT_DIRECTORY from . Here, we need some manual calculation of addresses for each attribute for our later analysis. In the above definition, WORD is a computer word of 16 bites (2bytes), and DWORD is 4 bytes. We can easily infer that, MajorVersion is located at offset 0x8, and AddressOfFunctions is located at offset 0x1c. We can soon infer that there are 0x523 functions exposed in the export table, and there are 0x523 names exposed. Why? Because the NumberOfFunctions is located at offset 0x14 (thus its address is 0x7c903400+0x14 = 0x7c903414) For another example, look at the attribute "Name" which is located at offset 0xc (i.e., its address: 0x7c90340c), we have number 0x00006787. This is the address relative to the base DLL address (assume it is 0x7c900000). Then we have the name of the module located at 0x7c906786. We can verify using the "db" command in WinDbg (display memory contents as bytes): you can verify that the module name is indeed ntdll.dll. Read page 26 of , you will find that the "AddressOfFunctions", "AddressOfNames", and "AddressOfNameOdinals" are the most important attributes. There are three arrays (shown as below), and each of the above attributes contains one corresponding starting address of an array. We can verify the first name (00006790): It's CsrAllocateCaptureBuffer. Note that a "0" byte is used to terminate a string. We can also verify the second name (000067a9): It's CsrAllocateMessagePointer. Note that array index starts from 0. What is the entry address of function CsrAllocateCaptureBuffer? The answer is: it's 7C91EB58. Think about why? (Pay special attention to the byte order of integers). We now start to analyze the code, starting at 0x40105C. Set a hardware breakpoint at 0x40105C (in code pane, right click -> Go To Expression (0x40105c) and then right click -> breakpoints -> hardware, on execution). Press F9 to run to the point. The first instruction should be PUSH DS:[EAX+8]. If you see a bunch of BYTE DATA instructions, that's caused by the byte scission of the code. Highlight all these BYTE DATA instructions, right click -> Treat as Command during next analysis and we should have the correct disassembly displayed in IMM. Now let us analyze the first couple of instructions starting at 0x40105C (in Figure 4). Continuing the analysis of Tutorial 7, we know that after reading the module information (one by one), the code jumps out of the loop when it encounters the ntdll.dll. At this moment, EAX contains the address of offset 0x18 of LDR_DATA_TABLE_ENTRY. In another word, EAX points to the attribute "DllBase". Thus, the instruction at 0x40105C, i.e., PUSH DWORD DS:[EAX+8] is to push the DllBase into the stack. Executing this command, you will find that 0x7C900000 appearing on top of the stack. Recall that the beginning of a PE file is the DOS header (which is 64 bytes) and the last 4 bytes of the DOS header contains the location of the PE header (offset relative to the DLL base) [see Section 2]. Hex value 0x3C is decimal value 60! So we now have EAX containing of PE offset. Observing the registry pane, we have EAX = 0xE0. We then infer that PE header is located at 0x7C9000E0 (which is 0x7C900000 base + offset 0xE0). Note the offset 0x78, its decimal value is 120. From Figure 1, we can soon infer that offset 0x78 is the address of the EXPORT table data entry in the IMAGE_DATA_DIRECTORY of the optional header. Thus, ESI now contains the entry address of the export table (offset relative to DLL base) ! After instruction at 0x40108c, Its value is now 0x7C903400 (starting address of EXPORT TABLE). (1) What does function 0x004138A8 do? What are its input parameters? (2) Which data fields of the export table are the instructions between 0x4010AD and 0x4010C4 accessing? (3) Explain the meaning of EDX*+C in the instruction at 0x4010BB. (4) Explain the logic of 0x4010CB to 0x4010F6. (5) What is the purpose of the loop from 0x401103 to 0x401115? (6) What does function 0x40165E do? What are its input parameters? (7) Explain the code between 0x401117 and 0x40113E. 1. Goppit, "Portable Executable Format - a Reverse Enginnering View", v1(2), Code Breakers Magzine, January 2006. I really have read couple of articles over pe executable file format to understand it more in depth. But yup i am agree, that you made few points more clear. Thanks for that. You made a VERY COMPREHENSIVE tutorials on malware analysis. but hardly to see any of your publication in malware problems. I saw your PhD thesis also was in different topic. Just curious. Your tutorials are very helpful. Thanks!!! finally add offset to base address. what is meant by image base address, virtual address and relative virtual address ? can anyone please explain this why its different ? You really make it appear really easy together with your presentation but I to find this topic to be actually something that I believe I’d by no means understand. It sort of feels too complicated and extremely extensive for me. I am taking a look forward in your subsequent submit, I will try to get the hang of it!.